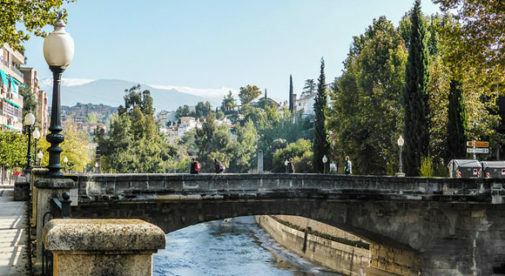 Marilyn and her husband Mike live in the historic city of Granada, in the foothills of Spain‘s Sierra Nevada mountains. The Arizona couple moved full-time to Granada in 2012, where they enjoy the warm weather, low cost of living, and a busy social life. The city of about 250,000 people is a major tourist draw due to its ornate Moorish architecture. Its old Moorish quarter, the Albaicin, is a steep, hilly neighborhood of winding cobbled streets and whitewashed buildings. The modern city, with its trendy shops and pristine boulevards, lies below. Marilyn and Mike, who are in their mid-50s, live in a renovated, one-bedroom apartment in the Albaicin. They pay about $565 a month for rent and utilities during Granada’s warm season, and around $678 a month during the rest of the year when they occasionally use the heating. Their entire monthly budget is about $1,920 a month, including the premium for their private healthcare insurance. “Our healthcare here is absolutely fabulous,” says Marilyn. “We pay €150 a month for both us. No co-pays, no deductibles.” Compare that to the $1,800 a month they paid for health insurance in the U.S.
Granada is home to a major university, whose 80,000 students help to create the city’s thriving food culture and nightlife. And Marilyn and Mike take full advantage of it. The two have an income they love, but they never work more than 12 hours a week. “Usually it’s more like eight or 10,” says Marilyn. Travel Writing: Is Your Income as Fun as This?